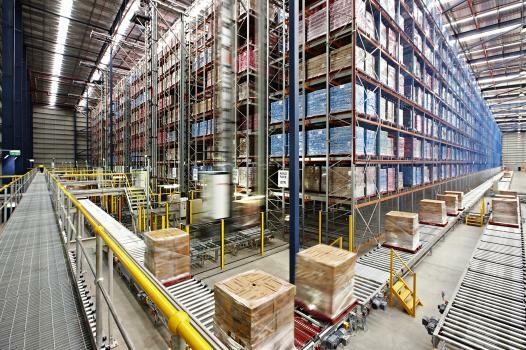 As the cost of energy, land and labour climbs, operators of cold storage warehouses are increasingly looking to automation to control costs. “There are a growing number of automated point solutions that can drastically reduce escalating operational costs,” says Jeff Hedges, director of business development for Dematic. In some instances, automation can reduce space requirements by as much as 50%, reduce energy consumption by 80% and labor as much as 70%. Those savings are realized in a variety of ways. 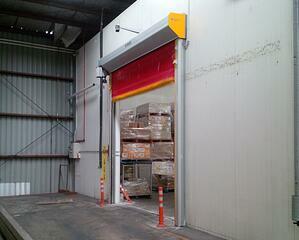 Automated storage and retrieval systems (AS/RS) are finding a home in cold storage facilities. The high-density, rack-supported storage provided by an AS/RS allows for deep and tall designs that maximize the cube of a facility and minimize a facility’s footprint. What’s more, a carefully planned AS/RS can service a facility’s needs for a number of years without an expensive expansion. “Customers who have cold storage needs generally have very specific requirements that are unique to their business,” explains Bob Novak, area market manager for Interlake Mecalux. Whether building new or working within an existing facility, Novak says an analysis should begin with determining your needs now and three to five years down the road. High-density storage not only creates a smaller area to cool, it also creates an environment that minimizes heat loss. A smaller footprint, for instance, translates into a smaller roof, says Bill Leber, director of business development for Swisslog. “Since the roof is one of the places in an operation where air can escape, it literally pays to keep the area as small as possible,” says Leber. Creating dividing zones within your site can also assist with minimising the flow of controlled air into zones where it is not required, such as delivery or drop off zones within the warehouse. Consider looking at barriers and zoning such as Temporary Flexwall Diving barriers which can be moved with you if you change sites or are renting a site which requires zoning. Finally, automated storage also minimizes the amount of warmer air that enters the temperature controlled area, explains Dan Labell, president of Westfalia. In the case of pallets, an automated system allows for the ingress and egress of pallets through a small opening that is immediately sealed once the pallet passes through. “The warmer the product is upon entering, the more it draws on refrigeration cost, so you have to design for that,” Labell says. 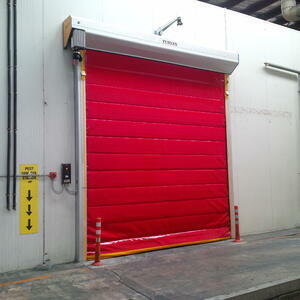 Movidor Rapid Doors can be manufactured bespoke within a warehouse / facility to allow for pallets entering the site and will maintain that the door is only opened when an item is passing through and then closes automatically once the pallet has passed through. Palletizing is another area of operations in cold storage that is ripe for automation thanks to advancements in robotics, says Brian Keiger, logistics account manager for Kuka Systems. “For years, frozen product manufacturers have struggled with the challenges of palletizing their frozen products efficiently and cost-effectively,” says Keiger. “In the past, due to limitations of the robots, product had to come out of the freezer to be palletized, and then conveyed back into the freezer.” Every trip back and forth into the freezer could result in the introduction of ambient air that would have to be cooled. 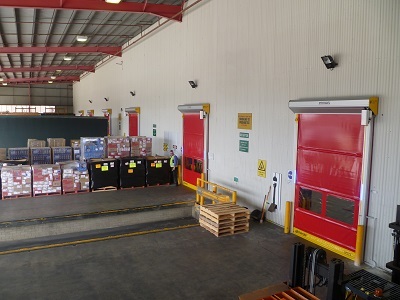 Movidor Freezer doors can assist with reducing the loss of cooled air whilst allowing pedestrians / forklifts and larger vehicles to pass through. 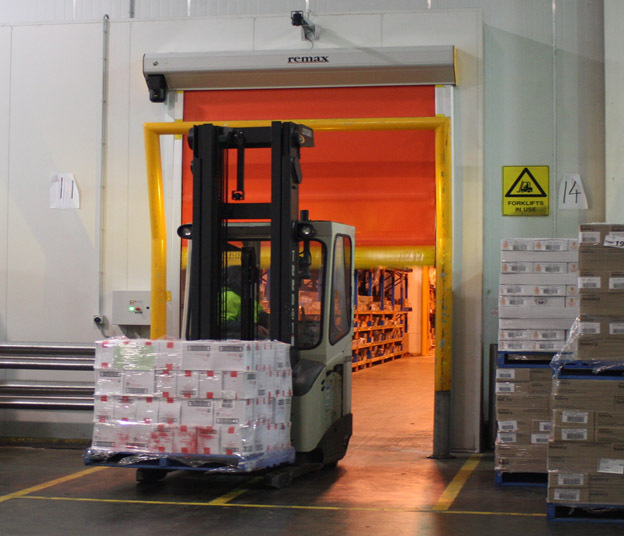 New robot technology, cables, seals, doors and barriers, energy supply and lubricants specifically designed for the harsh freezer environment enables palletizing to be done inside the freezer without protective heating shrouds. That eliminates conveyors and ice build-up on the products while minimizing the handling of frozen goods by workers in sub-zero temperatures.